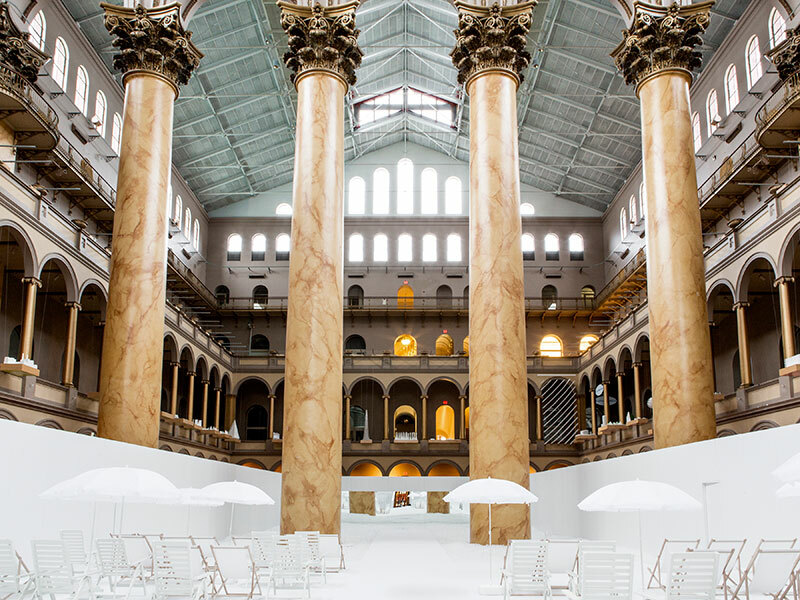 The National Building Museum in Washington, DC, is hosting THE BEACH, from now until September 7th. A pity I live nowhere near there – but maybe this will inspire other installation artists to explore this kind of extreme interactivity in future works. THE BEACH is oddly commercialized and sleek, sort of an upper-middle-class, art hipster, yuppie paradise. It’s also vaguely humorous (how can you not be, when you place a giant ball pit in the middle of a museum) and really seems like the sort of thing that you’d find in some sort of future dome-city where the real beaches have all been nuked off the planet and humanity splashes around in oceans of plastic balls. Maybe that’s what Snarkitechture was going for – a fun, lighthearted installation with a little bit of dystopic background static. So about that ball pit. It IS huge, at 10,000 square feet, composed of almost one million recyclable plastic balls in a uniform translucent white. At the end of this ball “ocean” is a wall of mirrors that play the role of a distant horizon, providing the illusion that the ocean goes on forever. 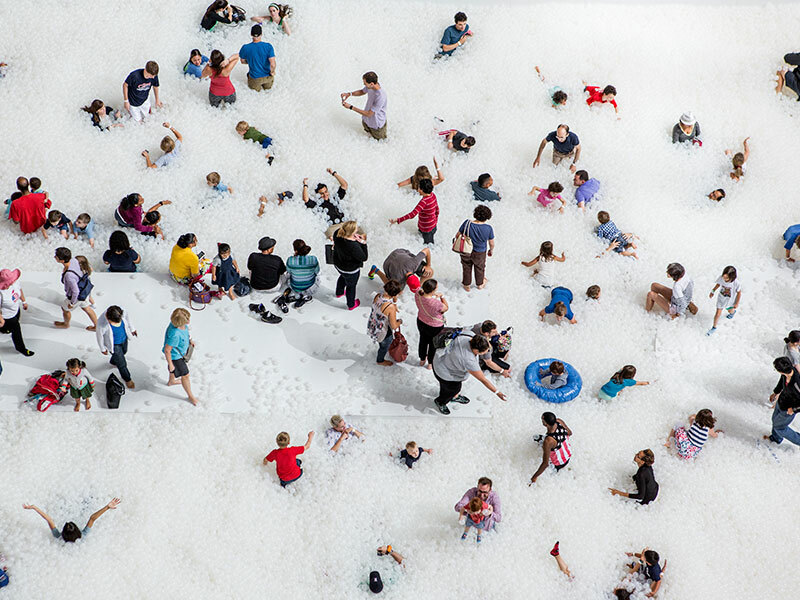 The foggy, milky color of the ball pit as a whole is dripping with ultra-modern minimalist sensibility but it’s also the colour of so many plastic shopping bags – a fun parallel, considering what those do to the real ocean. Brooklyn-based creators Daniel Ashram and Alex Mustonen have made THE BEACH in keeping with Snarkitechture’s usual style. They frequently do the stark black and white thing, playing with the aesthetic of a consumerist and design-oriented society. It’s not without humour – in installations like their ultra-sleek marble run for Art Basel at Miami Beach, and The White Room, made for a Chromeo album release and focusing on a series of “all white matte objects,” they really sell the idea that the future won’t be chrome, but stark white. They never lose their sense of humour but there is a palpable “evil megacorporation” undertone in many of their works. I dig it. It’s not all play – the National Building Museum (which I’ll admit I had never heard of before reading about this artwork) has boasted that its summer admissions sales have nearly tripled since last year with the installation of the work this summer. That’s just savvy business. So what about THE BEACH is attracting so many people? Obviously a ball pit that’s big enough for adults is a draw whether we want to admit it or not. But that’s a gimmick. Behind that, there’s an actual subversion of what people understand the museum space to be. When the general air of the museum is “look, don’t touch” – THE BEACH begs you to get all up in it, sit on it, swim through it, throw bits of it at your friends. It encourages guests to sit in chairs and idle on its shores, eat organic, fair-trade snacks from the Union Kitchen snack bar (acting as mock concession stand) – to just treat it like a real beach. All these activities seem to exist in a place of passive opposition to the traditions of a museum, where food is forbidden, guests glance at paintings and sculptures for a few seconds before moving on, and where touching any artwork is, obviously, strictly forbidden. So you tell me: are Ashram and Mustonen building the synthetic beach in preparation for a future in which we can’t visit the real thing? Are they setting up a novelty in the here-and-now to have us look at it in 200 years and see it as a pale imitation of what once was? Probably not, but I’ll be damned if that isn’t in keeping with the dark, snarky humour that is the firm’s namesake. An interesting side effect of inviting people into a touchy-feely space like this is that the sanitation issues that you should probably expect have also come into play. It’s minor fear-mongering for the most part. One case of pink eye, one cold, both that are only circumstantially tied to ball-pit exposure. The museum assures visitors that all of the balls in the pit are molded with antimicrobial agents, as well as being sprayed with antimicrobials and cleaned nightly. Now that’s what our beaches are missing – that alcohol smell of hand sanitizer. Imagine yourself safe in each milky white bubble! Each could represent a sealed antibacterial shell for the immune-challenged. Surely a few cases of contagious illness are preferable to shark bites, jellyfish stings, sunburns and sand in the shoes. THE BEACH, the plastic beach, a wonderful, hilarious art piece and a chilling glimpse into one possible future. If you’re lucky enough to see it, enjoy it as a temporary fun afternoon – or go home unable to shake the feeling of slight sadness, like you’ve seen a premonition that you don’t quite understand yet. The determining factor – whether this piece is the future of museums or the future of beaches. Read my slightly less rambling coverage of the piece on The Speaker! I can’t decide if Japanese artist Azuma Makoto loves flowers or hates them. His is a practice that seems at times bent on putting gorgeous plants through the most hellish of trials and punishments, while at the same time elevating something you can technically find in your backyard to the status of high art sculpture. It’s sort of like Hannibal for florists. 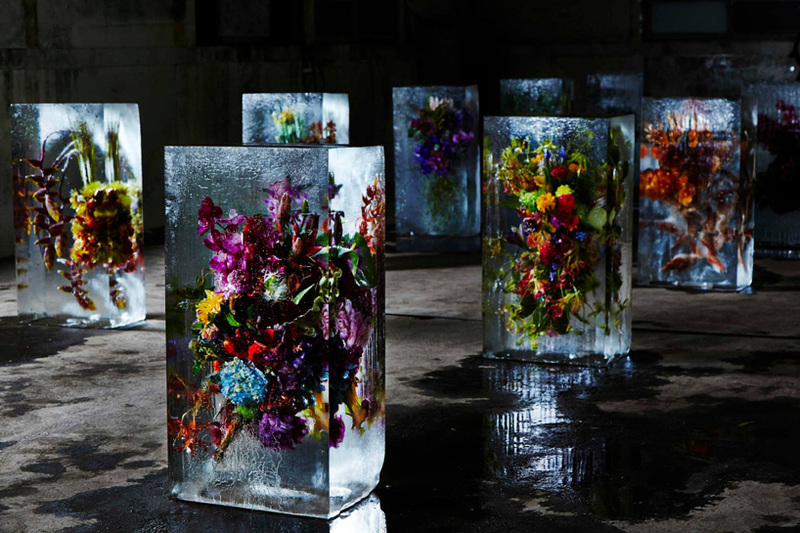 I was first introduced to Makoto’s work when I came across an image of his frozen flowers. In an exhibition held in Japan in the winter of 2014, Makoto froze a number of large, lush flower arrangements in cartoonish crystal-clear blocks of solid ice. Think the block of ice that Steve Rogers gets caught in for 70 years. The sort of thing that would probably never happen by accident in real life. I don’t know how the artist did it, but there must have been some scientific consultation going on for him to get the arrangements to look just so, like they were blowing in an invisible breeze, while suspended in effective cryostasis. I think my favourite part of this piece is the backdrop that Makoto chose. A barren warehouse that seems in direct contrast to the liveliness of the flowers. The wet concrete floor, stainless steel apparatus and chains make me think of a slaughterhouse or industrial factory. Not really a place for flowers. That tired old word juxtaposition is almost as alive as the plants seem to be in this piece. I could talk about the slow death that the plants experienced as the ice slowly thawed leaving them wet and wilted on the floor, but there aren’t any photos of the aftermath – not that I can find, anyway. That was behind the scenes, not meant for the viewing public. So Makoto used ice one time to suspend his plants but in other cases it’s a recurring cube enclosure that looks like a cross between torture device and display case. A plant, sometimes a Bonsai tree, is held in place by four metal cables, leading to the corners of a small metal box, just a frame, with open sides. It’s an innovative vase, but provides the plant no protection or access to necessary nutrients. The plant becomes a beautiful object for a very limited period of time. Taking this further, Makoto sent flowers into space. Well, not technically into space, but into the upper levels of the earth’s atmosphere, about as close to space as you can get without being in the vacuum. Why worry about the plants, suspended as they are in their metal cubes, days already numbered? I imagine they looked lovely for a few hours floating peacefully in the stratosphere, until they began to fall and wither. I’m not sure what the air and temperatures up there would do to a plant – I don’t think Azuma Makoto did, either. Launched out of Black Rock, Nevada, earlier this summer, the project isn’t the least Burning-Man-esque artwork I can think of, yet there’s something more focused and serene about it. The plants become Exobotanica, the artist’s website explains, they become extraterrestrial beings, freed from the earth. Perhaps this is a glimpse into Makoto’s true feelings about the plants – perhaps they are more, or can offer more than what we see them as. I wrote about Makoto’s studio in an upcoming post on Artist Run Website – his atelier, as many websites call it, because “studio” seems almost crass for the delicacy of the work that is being done here – and it, alone, is a work of performance art. 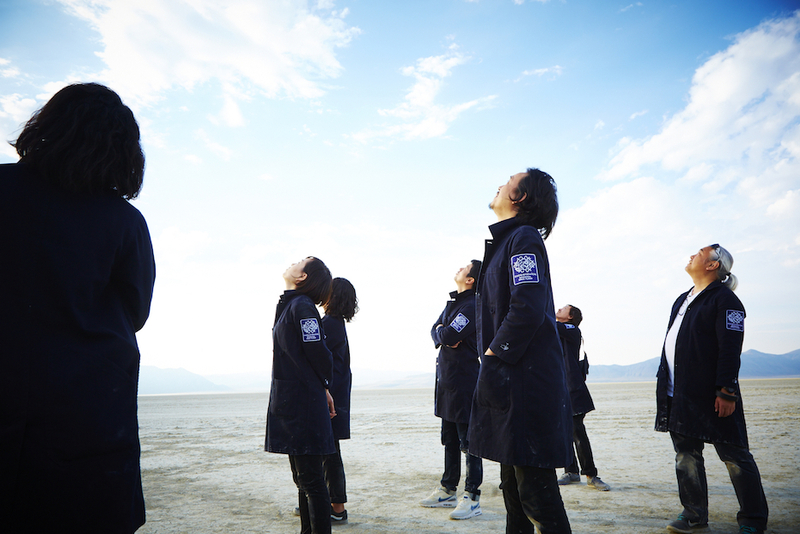 Look at Makoto’s Exobotanica assistants, in uniforms with special patches on them. A team of scientists preparing for the future of art. I want to read that story.